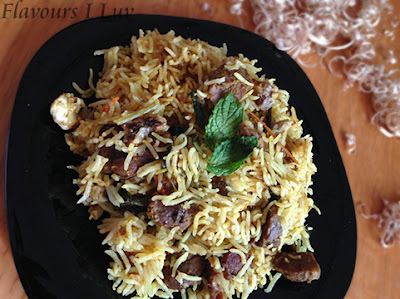 Erachi choru is a popular authentic rice recipe of malabar, especially very common between malabar Muslims. 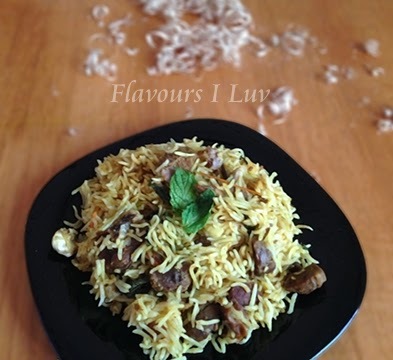 I saw some recipes of erachi choru while googling, just like biriyani recipe. Same process, first make meat masala then ghee rice and mix both of them. Actually in malabar we serve biriyani, with rice and masala in separate dish. 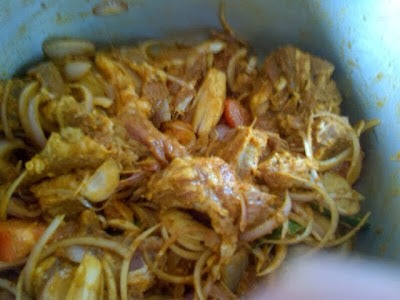 But erachi choru is a mix of meat and rice, so it has a different appearance from biriyani. Its taste also stands away from biriyani. Its also easy to make. I made this in traditional way. You can use mutton or beef for this recipe. I used beef here. Put the cleaned beef, finely sliced onion, chopped tomato, crushed green chillies, crushed ginger and garlic, all the masala powders, fenu Greek seeds, fennel seeds, coconut oil and salt (enough to meat and rice) in a pressure cooker. Mix well and keep for some time. No need of adding water, meat cooks in its own water. Keep the cooker in medium fire up to 4 whistles. Clean basmati rice and soak for 10 minutes. Drain. Open cooker lid after steam escapes its own. Add rice into it, mix well. Then add boiled water up to 1 inch top of rice. Check for salt this time and add enough. Close the lid and cook up to 1 whistle. Off the flame and allow to escape steam its own. Open the lid and add coriander leaves .Mix well and serve it hot with raitha or pappad. yummy and tempting erachi choru.. This looks so tempting! Lovely blog. Thanks for stopping by my page. Happy to follow you!